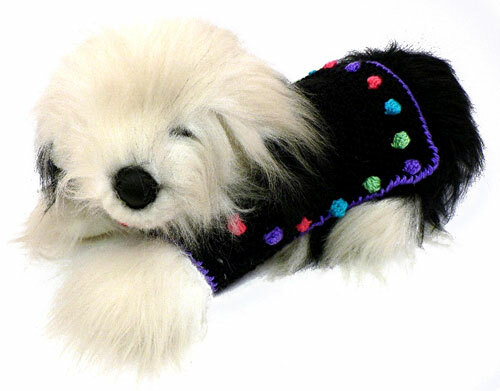 Crochet a colorful coat for your favorite pooch with this dog coat crochet pattern. The bright bobbles makes this a fun, quick and easy crochet project to keep your dog warm through the winter. Yarn: Caron International's Simply Soft (100% acrylic; 6 oz/170 g, 315 yds/288 m skein): 1 (2, 2, 3) skeins MC. Caron International's Simply Soft Brites (100% acrylic; 6 oz/170 g, 315 yds/288 m): 1 skein A; 1 skein B; 1 skein C; 1 skein D, all sizes. Shown in: #9727 Black (MC); #9610 Grape (A); #9607 Limelight (B); #9608 Blue Mint (C); #9604Watermelon (D). Gauge: In double crochet, 12 sts and 8 rows = 4"/10 cm. bobble: Yarn over, insert hook in next st and draw up a loop, yarn over and draw through 2 loops on hook, yarn over and draw through 1 loop (2 loops on hook), [yarn over, insert hook in same st and draw up a loop, yarn over and draw through 2 loops on hook, yarn over and draw through 1 loop] 4 times (6 loops on hook), yarn over and draw through all 6 loops on hook. dc2tog: Double crochet 2 together – [Yarn over, insert hook in next stitch and draw up a loop, yarn over and draw through 2 loops on hook] twice, yarn over and draw through all 3 loops on hook. To change colors when making bobbles, work the last double crochet (or ch 3) before the bobble to the last yarn over, yarn over with the bobble color and draw through all loops on hook to complete the double crochet (or ch 3). Work the bobble with the bobble color to the final yarn over, yarn over with MC and draw through all 6 loops on hook to complete the bobble. In the coat shown, the bobbles are worked in the following order: A, B, C, D, C, B, A, B. However, any order, or even a random color selection, will work. To use scrap yarn for bobbles, estimate about 2 yards per bobble. Three separate balls of MC are used when forming leg openings. Before beginning chest shaping, ensure that you have three separate balls of MC (roll additional balls from a larger skein). With MC, ch 36 (44, 48, 56). Row 1 (RS): Dc in third ch from hook (beginning ch counts as first dc), dc in each remaining ch across, turn—35 (43, 47, 55) dc. Row 3: Ch 3, change to A, bobble in next st, *change to MC, dc in next 3 sts, change to C, bobble in next st; repeat from * across to last st; change to MC, dc in last st, turn—9 (11, 12, 14) bobbles. Rows 4 and 5: Ch 3, dc in each st across, turn. Row 6: Ch 3, change to C, bobble in next st; change to MC, dc in each st to last 2 sts; change to C, bobble in next st; change to MC, dc in last st, turn. Repeat Rows 4–6 until piece measures 5 (6 1/2, 7 1/2, 9)"/12.5 (16.5, 19, 23) cm from beginning. End with Row 5. Fasten off. Turn work. Row 1: With MC, ch 10 (11, 12, 14), dc in first dc of Coat; change to C, bobble in next st; change to MC, dc in each st across to last 2 sts; change to C, bobble in next st; change to MC, dc in last st, ch 11 (12, 13, 15), turn. Row 2: Dc in third ch from hook (beginning ch counts as first dc), dc in each remaining ch across, dc in each st across, dc in each ch across, turn—55 (65, 71, 83) sts. Row 4: Ch 3, dc in next 10 (11, 12, 14) sts; change to C, bobble in next st; change to MC, dc in next 31 (39, 43, 51) sts; change to C, bobble in next st; change to MC, dc in each st across, turn. Rows 5 and 6: Ch 3, dc in each st across, turn. Row 7 (divide for leg openings): Ch 3, dc in next 4 (4, 5, 6) sts; join a separate ball of MC and dc in next 6 (7, 7, 8) sts; change to C, bobble in next st; change to MC, dc in next 31 (39, 43, 51) sts; change to C, bobble in next st; change to MC and dc in next 6 (7, 7, 8) sts; join a third ball of MC and dc in remaining 5 (5, 6, 7) sts, turn. Continue to work with three separate balls of MC, to form leg openings. Repeat Rows 5–7 until piece measures 8 1/2 (11 1/2, 13 1/2, 16 1/2)"/21.5 (29, 34.5, 42) cm from beginning. End with Row 7. Repeat Rows 5­–7 once more, using only one ball of MC to work across all stitches to close leg opening. Piece should measure 10 (13, 15, 18)"/25.5 (33, 38, 45.5) cm from beginning. Row 1: Ch 3, *dc2tog, dc in next 2 sts; repeat from * to last 2 (0, 2, 2) sts, dc in remaining sts (if any), turn—42 (49, 54, 63) sts. Row 2: Ch 3, dc in each st across, turn. Row 3: Ch 3; change to A, bobble in next st, *change to MC, dc in next 3 sts; change to C, bobble in next st; repeat from * to last 0 (3, 0, 1) sts, dc in remaining sts (if any), turn. Row 4: Ch 3, dc in each st across, turn. Fasten off. With RS facing, join MC with slip st in edge of leg opening. Round 1: Ch 3, work 18 (30, 38, 50) dc evenly spaced around leg opening; join with slip st in top of beginning ch. Round 2: Ch 3, dc in each dc around; join with slip st in top of beginning ch. Repeat Round 2 until Leg measures 2 (3, 4, 5)"/5 (7.5, 10, 12.5) cm from beginning. Fasten off. With WS facing and using yarn needle, sew edges of chest together. With RS facing, join A with slip st in edge. Round 1: Ch 1, reverse sc evenly spaced around edge. People, people, people. Do you not understand that FaveCrafts did not design this pattern, that they are simply SHARING it? Someone named Beth Temple designed it for Caron Yarns. You might have better luck getting help by going to Caron's website and sending them an email..
What do I think? I think you need to put ratings -easy, bet., etc on these patterns as you do so (thankfully) on others. Maryann, I recreated the bobble stitch and it looks like it all takes place within the space of one stitch. So just continue through w/o the bobble..meaning whenever there is a direction for a bobble, and say you're doing single crochets, just single crochet instead of working on a bobble. Good luck, hope your fur baby is warm and cuddly soon! Been trying to figure out how to do this without the bobbles and the instructions aren't really easy. I'll keep trying. My dog is a male so I don't want them. It would be nice to put a (w/o b) to continue on without it. Thank you! Maryann, I am confused about this pattern specifically row 7 divide for leg openings. can you send me a picture of the bobble coat without the pup in it. Am I supposed to leave a split with the main color ball change or is it all together then the leg pieces are folded either into the chest or down to match up edges. I know this sounds confusing but, I am really confused about what to do next and how to do it. Help Please!